We prepared ourselves a bit better than last year (which already was a lot better than the first year). 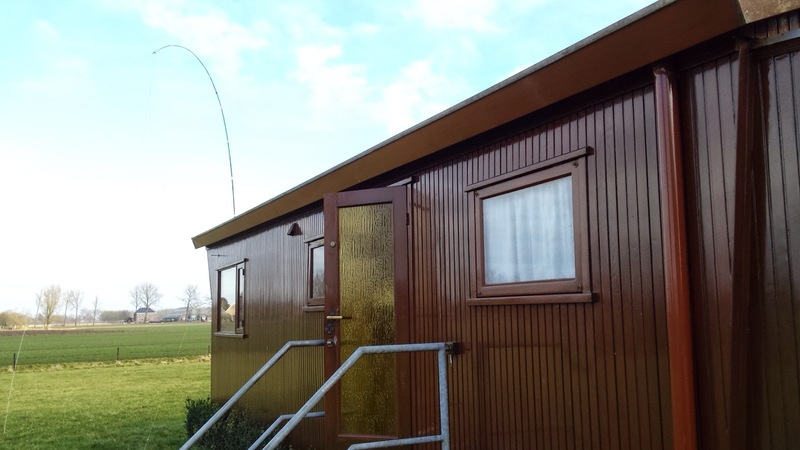 We got ourselves a nice temporary special call PE55E and we constructed and tested a number of different wire antennas well before the contest (last year M was still working on the 160m antenna a few hours into the contest). M had arranged a proper location at a camping ground near to where he lives and - importantly for this contest - in our province of Gelderland. The place definitely was an upgrade of the cold and windy hut we were in last year. It even featured WiFi so we had online cluster info in N1MM. 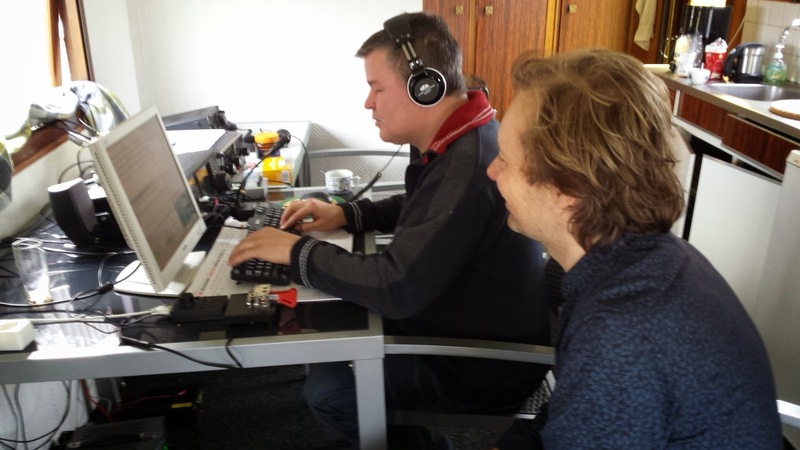 M started the installation of the antenna park together with his station manager on Friday. 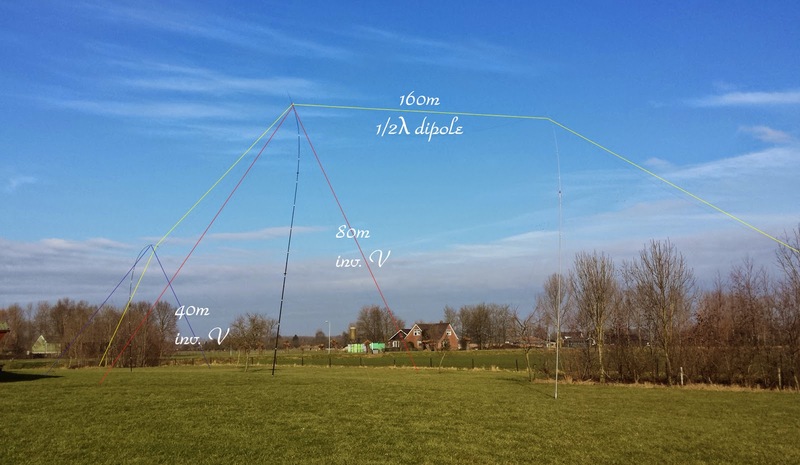 They installed the three main poles - 12m, 18m and 12m high - that were holding the wire dipoles for 160m (supported by all three poles), 80m (inverted v from the center pole) and 40m (inverted v from the nearest pole). We tested this setup before (more info in this post). 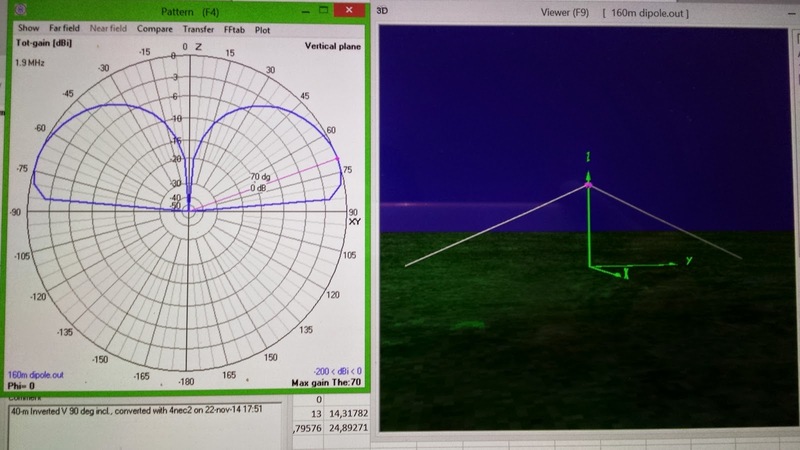 Modelling showed this setup results in more gain on 160m and less gain on 40m than last year. As we would be running 3 to 4 times the power of last year on the low bands we weren't too focused on getting the maximum gain though. Saturday morning NO and YY arrived to complete the contest station, adding an end fed for 20m, a hex beam for 20-15-10m and a yagi for 10m. 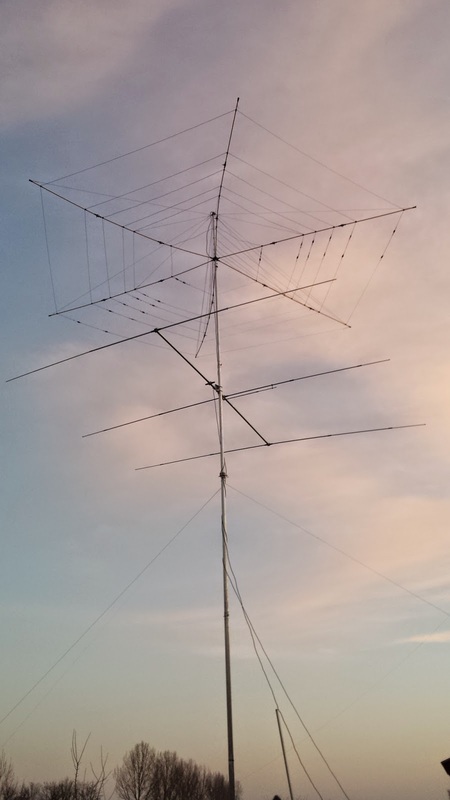 As NO had to leave Sunday morning before the end of the contest - taking the hex and the yagi - we set up an extra 5/8 vertical for 15m we built and tested just 2 weeks before the contest. When we finished setting up the station we had 7 antennas at our disposal - quite an impressive set-up for a temporary station. We were running 300-400 watts PEP into them via an icom 756P3 hooked up to a pc running N1MM. We manned the station for 24h by sleeping in shifts. The camping provided us with two extra sleeping places conveniently located outside the noisy shack. M was our CW operator while YY and NO took care of the phone contacts. As the weather was much friendlier than last year we had no calamities (as blogged about in this post). All went rather smoothly. Conditions on the high bands seemed a bit better than we remembered from last year. We will have to compare our logs to see how this worked out. A better preparation allowed us to operate with minimal switching times between operators. We used our experiences from last year to choose the right band and mode at the right time and we had more power at our disposal on the low bands (300-400w as opposed to 100w last year). This has resulted in far more contacts and more multipliers than last year. We logged approx. 800 contacts last year during our first real try in this contest and came in 6th place. This year we set our goal at 1000 QSOs and surpassed that by a considerable margin. We will add more information about our results once we have taken the time to run our log through the PACC log robot and compare our results in more detail with the results of last year (numbers, multipliers, dx per band).